President Moon Jae-in has expressed his deep regrets over U.S. President Donald Trump’s apparent cancellation on May 24 of a planned summit with North Korea scheduled for June 12 in Singapore. “I feel perplexed and regretful by this decision,” said President Moon as he was presiding over an emergency meeting of the National Security Council (NSC) on May 25. The meeting lasted for one hour and started at 12:00 a.m. that day. The meeting was held immediately after President Trump released his letter that informs North Korean leader Kim Jong Un that he would call off the scheduled U.S.-North Korea summit. “It’s hard to resolve sensitive and challenging diplomatic issues with this current method of communications. We hope that the leaders will resolve problems through direct and close dialogue,” he added. 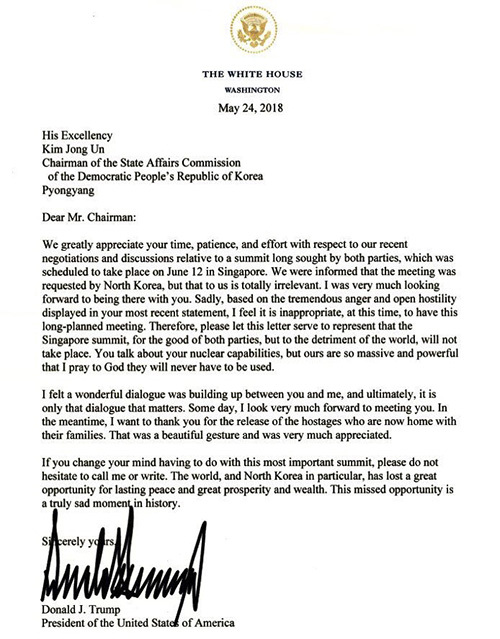 “Therefore, please let this letter serve to represent that the Singapore summit, for the good of both parties, but to the detriment of the world, will not take place,” he wrote.